As a follow-up to yesterday’s post about The Fifth Assassin, I wanted to dedicate an entire post to meeting the author, Brad Meltzer. Living in Wilmington, NC, there were not a lot of options to meet national authors, never mind big deal national authors, so I knew when I relocated to the Denver area that I would be in for a treat. I scoured the Tattered Cover event sections long before I moved here and was bummed to have missed out on so many great signings. But, when I saw Brad Meltzer on the list it assuaged any and all sadness that I felt about previous authors. This was because I LOVE his books. And when I say LOVE, I don’t mean that I like them simply because I met him, I mean I’ve loved them for years. Like any voracious reader, I have had some ‘lulls’ that I am not proud of. During one of these lulls, a friend of mine gave me The Book of Fate. She was very adamant that I would love the book and so, at her pushing, I started reading. I finished the book in less than two days and then went on to read every other book he had written. 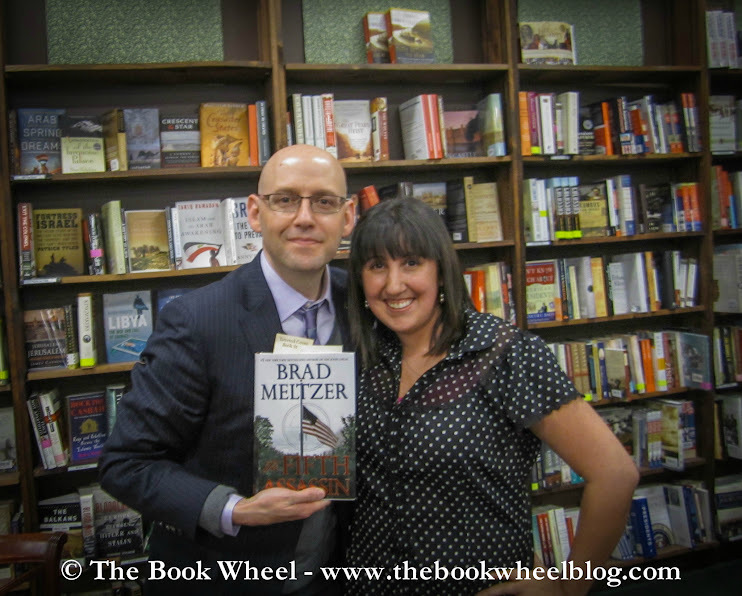 So, when I say that I was excited to meet Brad Meltzer, I mean I was really excited. Maybe even more excited than these guys at their pajama party. I’ll be honest: I tweeted Mr. Meltzer a few times about how excited I was and I couldn’t believe that he responded. Not only that, but when I showed up and strategically stuck my Book Wheel business card in the book (to see if he took it or would return it), he took it AND exclaimed, “The Book Wheel! You want a picture! I read that on Twitter!” Words cannot describe how awesome this was. Not because he knew what The Book Wheel was (which is pretty neat on its own merits), but that he cares enough about his fans and remembers them. I’m pretty sure that in five years he won’t remember me, but because he remembered me that one time I will forever be a fan. But enough about all of that. It’s time to talk about his actual visit! Let me just say that Brad Meltzer is funny. I don’t mean author-awkward funny, but actual laugh-out-loud hilarious. His stories about body parts and holding pieces of skull were entertaining and even had my husband laughing. Full disclosure: my husband has never read him. And he also told an amazing story about a letter he received from a sailor, how it inspired him to take action, and how it came full circle a decade later (you can read about the story here). But most importantly, he emphasized the importance of saying thank you. At the end of his talk, he implored us to find one person who gave us a chance, changed our lives, or inspired us and to then write them a thank you letter. As a big believer in thank you’s, I took his advice as a sign that I should act on some of the “thank you’s” I had been throwing around in my head and wrote two. One was to an author whose book changed my outlook on life and the other, which will be complete when a friend of mine finds a contact address, will be to my 11th grade English teacher who instilled in me a greater appreciation and love of books. I don’t think I would have this blog without her. But the person I must really thank is Mr. Meltzer. Aside from being an excellent author, funny, personable, and endearing, he also sincere and genuine. He clearly loves his wife and family, works hard to connect with his fans, and inspires others to commit acts of kindness. There are not enough everyday people like this and to see it in someone who utilizes his platform as a public figure to spread joy and thanks is an inspiration. Now I am not only a fan of his books, but a fan of him as a person. Thank you, Mr. Meltzer! For my review of The Fifth Assassin, click me!